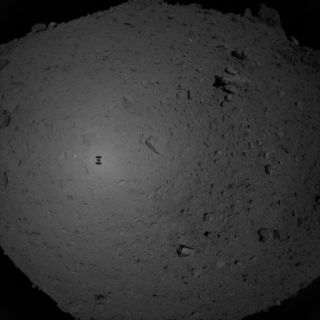 An image of the Hayabusa2 spacecraft silhouetted against Ryugu's surface, captured by the probe during its sampling procedure in February. Japan's Hayabusa2 mission to the asteroid Ryugu arrived at its destination prepared to make that possible, through a maneuver called the Small Carry-on Impactor operation. That operation is scheduled to play out tonight (April 4 in the U.S., the morning of April 5 at the Japan Aerospace Exploration Agency, or JAXA, headquarters). You can watch a live broadcast from mission control with English dubbing on Space.com, courtesy of JAXA, or directly through the agency's YouTube channel, beginning at 8:30 p.m. EDT (April 5, 0030 GMT). The operation is designed to help scientists better understand the asteroid's interior. Over the course of about 40 minutes, the Small Carry-on Impactor will separate from the main Hayabusa2 spacecraft, which will then hide itself away on the other side of the asteroid to protect itself from flying debris. Along the way, Hayabusa2 will release a camera that will watch the impact from about 0.6 miles (1 kilometer) away and send back a couple hours' worth of photographs. Then, it's showtime. The impactor will approach the asteroid's surface, then deploy onboard explosives. The detonation will boost the impactor's speed to 1.2 miles (2 km) per second in a fraction of a second, creating a fresh crater on Ryugu. The deployed camera will photograph that entire event, recording how debris flies away from the impact. That data will, in particular, help scientists understand Ryugu's structure, including how much empty space is inside the rock. Once the dust settles, Hayabusa2 will creep out from behind Ryugu. And if all goes well, scientists are hoping they'll be able to bring the main spacecraft down to the surface near the fresh crater to get a close look at the newly formed feature — and maybe even grab a sample of nearby rock. The Small Carry-on Impactor operation is one of Hayabusa2's last tasks at Ryugu: All that's left for the spacecraft is to deploy one more small rover, called MINERVA-II 2, which should take place late this summer. Then, it's time to head back to Earth, samples onboard.